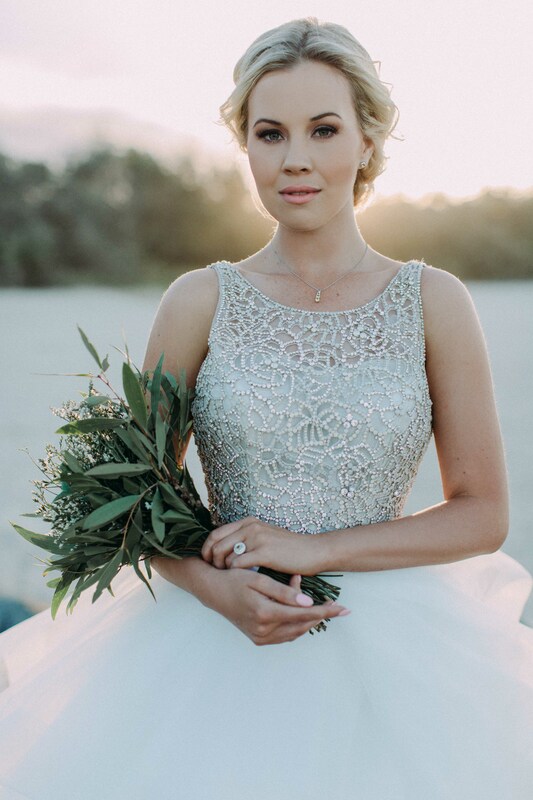 Katie Douglas was preparing for her wedding day like any other excited bride to be; hurriedly racing around town on errands, finalizing floral arrangements and attending social engagements on Queensland’s beautiful Sunshine Coast. For the last task of the day (getting a spray tan), and perhaps distracted, she removed her cherished diamond engagement ring and placed it in her car’s centre console. Within an hour, it was stolen. She was devastated, and it was too soon before the wedding to replace it; the show had to go on. We attended the wedding and can say most honestly that the intimate setting at the Maleny Manor in the Sunshine Coast Hinterland with the beautiful bride, groom Reece, and many fun loving family and guests made for an unforgettable day. You can however, imagine the disappointment of not having her engagement ring, the ring which Reece had so thoughtfully chosen and romantically proposed with. Luckily mum Sue came to the rescue with her own diamond engagement ring as a replacement. Some six months later we approached Katie to model some of our latest jewellery designs in a styled after-wedding shoot with the renowned wedding planner Elnora Turahan of Grant Hochzeit from Berlin, Germany, together with her talented photographer Viktoria Gaus of Gausfotografie. Of course she said yes! Not only for the chance to once again wear her stunning Hayley Paige bridal gown, but also as a very kind favour for close family friends. Katie’s parents Rick and Sue once owned a sapphire mining claim in Rubyvale next door to us, and we quickly became friends and even got naturalised as Aussies together! On days off from his coal mining job Rick would visit our gallery while Katie played in the garden. The proud and doting father would push her on the swings between cups of coffee and inspecting Peter’s latest sapphire finds. 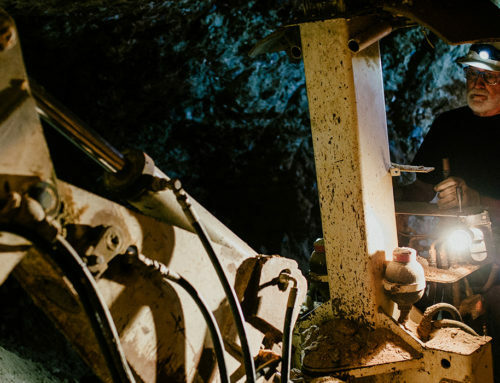 When we first set out on our latest marketing campaign we couldn’t have imagined a better model; we wanted real people, with a connection to us, our region and who loved wearing our jewellery. And from the day the of the wedding, we couldn’t let the idea go… Katie would be perfect! On the day of the shoot Katie arrived at the first location like a seasoned professional model, rather than a first time novice, she even had her own bouquet (did we mention she is a floral designer for Mondo Floral Designs). Together with mum Sue, they settled in with some sparkly and nibblies while Elnora and Viktoria readied the shoot. With a few moments to relax, she inspected the jewellery she’d soon be modeling. It’s worth noting that she loves sapphires, her 18th birthday gift from her parents being a beautiful green sapphire ring, and the collection on show now was equally stunning… But they’re not diamonds and they’re not girl’s best friend, right? Diamonds they are not, but sapphires have their own special kind of appeal. 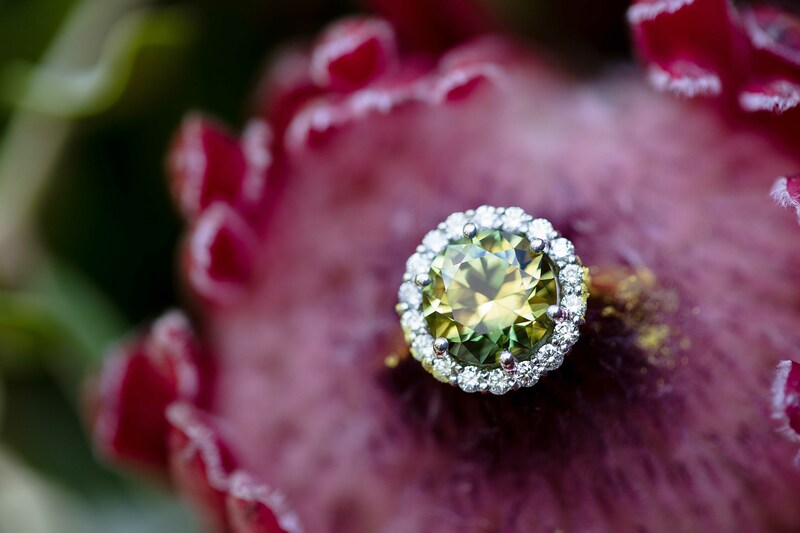 It is hard to describe the feeling that you get when you first see a colourful and vivid gemstone. They are alluring and powerful in their ability to evoke emotions. Each are unique with different mixtures of colours, hues and vibrancy. You feel like you have discovered one of Mother Nature’s precious creations that perfectly captures your individuality, like it was somehow meant for you and no one else. It is why for millennia people have sought precious and colourful gemstones; not only for their monetary value but for that feeling. For life is not just about the necessities; it is beauty, grace, art and love which gives it meaning. 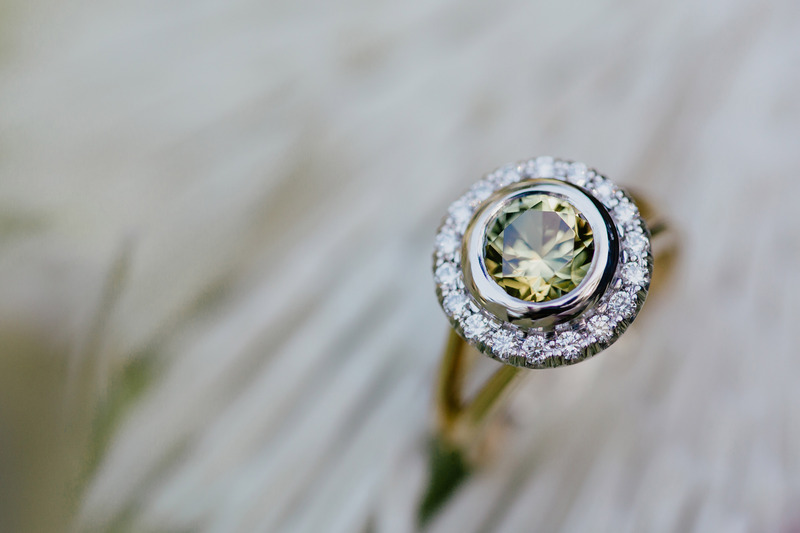 And so it was when Katie first caught sight of this stunning 4.5 carat yellow-green parti-colour sapphire and diamond halo ring. From that moment on it was the only piece of jewellery she had eyes for…it’s not her fault it just happened to be the largest and most expensive piece in the collection (sorry Reece). What mattered most was that she had found her new engagement ring, and luckily for her she’d already found the perfect husband! The rest of the shoot went smoothly as we moved to the beach at sunset and captured some amazing images including a wide a range of our sapphire jewellery which you can now view for yourself in the below gallery. We hope you see what we see; that sapphires add something interesting and unique as bridal jewellery by complimenting the beautiful natural features of the bride and floral bouquets, and creating stunning contrasts amongst the light shades of the dress and surroundings. We are proud for such a close friend to model our jewellery. We couldn’t be happier to help her to rediscover her love of sapphires and provide her with one of the most of cherished jewellery pieces of a woman’s life. With some slight modifications (she loves white gold after all and nothing beats custom made), Katie is now the very happy owner of a beautiful Australian Sapphire engagement ring!